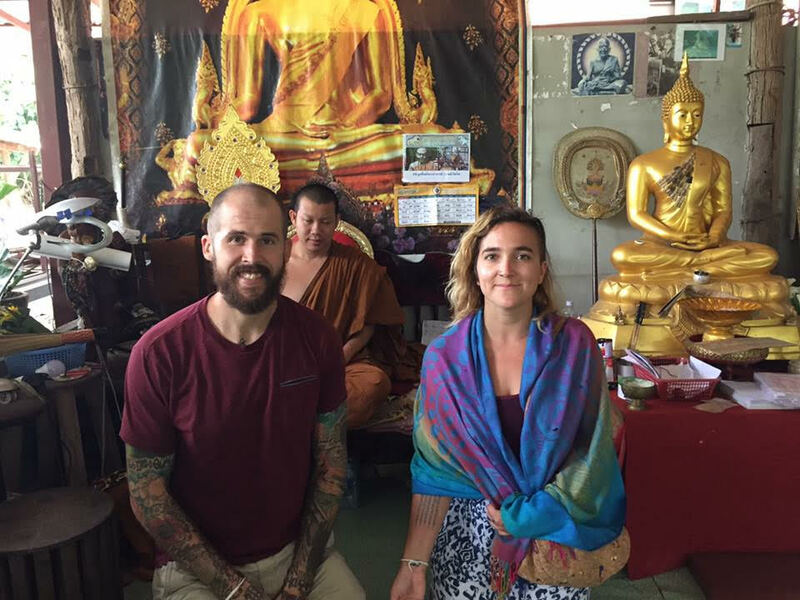 In anticipation of receiving my third sacred Sak Yant tattoo blessing next month in Chiang Mai with responsible tourism operator, Where Sidewalks End, I asked other travelers to share their transformative Say Yant experiences. Where Sidewalks End is the only reputable tour agency working directly with Sak Yant masters to help keep the tradition alive and ensure they receive fair wages for their services. The WSE ink experience is the most immersive, authentic, hygienic, and spiritual way to receiving a blessing from a Buddhist monk or Arjans. Local English-speaking translators will guide you through the process to ensure you understand the depth of the meaning of the yantra you’ll wear. They’ll also be on hand to explain to you the ancient traditions and superstitious beliefs of the powers of Sak Yant. I got my first two Sak Yants in 2015. It was a beautiful and meaningful experience where I explained to the Arjan why I was seeking protection and received customized blessings for my specific needs. I was bestowed with a triangular yantra that represents respect for Buddhism. The second tattoo is a section of a powerful mantra trailing down my spine. Learn more about my first experience being blessed by Sak Yant to learn more about incantation I wear. The ancient craft of permanently placing mystical yantra diagrams on the body for protection has been practiced for over 2,000 years in Buddhist sects across Southeast Asia. Powerful Sak Yant tattoos are used to heal, cure and overcome negative energy. There are more than 1,000 yantra designs that bestow magical powers or protection and fortune bearers. Learn more about Sak Yants here. Get your own sacred Sak Yant tattoo blessing from a Buddhist Arjan in Chiang Mai, Chiang Rai, Bangkok, Sukhothai, or Ayutthaya. Sak Yants aren’t travel souvenirs, they have deep spiritual implication and should not be worn by anyone who doesn’t understand their significance. You don’t have to be Buddhist to wear a Sak Yant but it’s respectful to learn about the historic importance of Sak Yant and have an understanding of what your tattoo represents if you’re going to be wearing the ink for the rest of your life. Sak Yant aren’t traditional tattoos and aren’t meant to be perfect, there may be small differences in the weight of the ink which could fade over time. Sak Yant tattoos are about their inpidual meaning, not aesthetic. Their imperfections are part of the beauty. But if you’re irked about imperfections opt to get a Sak Yant done in oil for an ‘invisible’ blessing. Here are 16 travelers who’ve received traditional Sak Yant blessings in Thailand. Kelley of The Culture Collective is the Founder of Impact Travel Alliance and recently got a Sak Yant tattoo in Chiang Mai. She shares that her Sak Yant experience was one of the most meaningful and immersive travel experiences she’s had. “My consultation with my Ajarn was pretty open-ended, we discussed everything from relationships, work, and my future goals. As we spoke, he began sketching a yantra and then showed me the hand-drawn design while explaining the meaning and specific blessings of my Sak Yant. The bottom of my Sak Yant is the foundation which represents stability and the ability to have faith in my purpose as well as a calmness in my decisions, ultimately contributing to my happiness. The center is a Buddha image which represents a blessing for inner peace. On each side are blessings for metamorphosis, as well as wisdom, fullness and good relationships with loved ones. The top spires are motivation and success for my goals and future endeavors. Natalie and Rob of Love and Road got Sak Yant tattoos together on their 10th anniversary! “Our Sak Yant has double special meaning for us. One is the blessing we got from it and the second is that we did it on the day we celebrated our 10th anniversary together. We didn’t plan to do the tattoo on 11th of January, 2016, but that was the date the Arjan was free, so we believe it was destiny. I was the first one to get the Sak Yant and talked to the monk for almost half an hour, telling him my fears and dreams. At the end, he suggested a mongkut kaew that can be roughly translated into a crystal crown. It’s a personalized Buddhist drawing and blesses me with good health and love. Rob was looking all the Sak Yant tattoo designs in the book and one spoke to him. He showed it to the monk and the meaning was everything he wanted: protection for travels and wisdom. Getting a Sak Yant in Chiang Mai was the experience of a lifetime, an important chapter of our story inked on our skin. This was such an interesting read. I hadn't heard of Sak Yant blessings and tattoos before. I especially love Alice's from Tea Cake Travels – it's beautiful! I'm so glad you found it informative, Sarah! Alice's Sak Yant is stunning! I'd never heard of a Sak Yant tattoo before this post. It's kind of blown my mind to be honest. It sounds like a really meaningful experience and even though I don't have one myself, I wear my only tattoo as a reminder of a journey. So glad to have been able to share with you a little bit about the beauty of Sak Yants! Travel tattoos are my favorite momento, I wear many! Would love to see yours! Oh wow, that's so awesome, thank you for doing that! She can reach out to me if she has any questions about the craft. Great round up post. Lovely hearing about everyone's Sak Yant experiences. Know most of the people in the post so makes it even better! Wow love em all and you are gonna get a THIRD oone??? sweet. I already want another though this hasn't even healed yet. haha. The feeling is surreal, isn't it? That's so cool that you know most of these travelers, Anna! Glad you liked hearing about their Sak Yant experiences. So glad you liked the post, Sandy! It is so surreal!! I hope you have the chance to get more some day. That's awesome that you were able to learn about it here! It's a Buddhist practice so it's common in Thailand and Cambodia! I believe in Myanmar they do have a similar tattoo process. I hope you can get one some day!